(Miami) Miami-Dade added 18,700 new payroll jobs in the past year and unemployment decreased to 5 percent in April, from 5.4 percent the previous month, according to statistics released Friday. Miami-Dade County created 18,700 new nonagricultural payroll jobs (not seasonally adjusted), from April 2016 to April 2017 which was a 1.6 percent increase. Miami-Dade County continues to show year over year gains. Improvements in the non-farm payroll jobs can be found in a variety of sectors. Between March 2017 and April 2017, Miami-Dade County increased nonagricultural payroll jobs by 1,700 or 0.1 percentage point. The not seasonally adjusted unemployment rate for Miami- Dade County was 5.0 in April 2017, which was a 0.4 percentage point decrease from March 2017 at 5.4 percent. This was the second time that the unemployment reached 5.0 percent since the recession. Compared to last year April there was also a 0.4 percentage point decrease with the unemployment rate at 5.4 percent. In April 2017, the seasonally adjusted unemployment rate for Miami-Dade County (taking seasonal fluctuations in the labor force into consideration) was 5.2 percent, which was an 0.1 percentage point lower than April 2016. From the data and analysis above, we see continued improvement in the local economy. Nevertheless, the community needs to remain focused on job-creation projects in targeted industries. These industries have been identified as the Miami-Dade County industries most able to create additional well-paying job opportunities, leading to an improved quality of life for Miami-Dade County residents. The Miami-Dade Beacon Council continues to aggressively work on attracting new companies to our community and work on the expansion and retention of existing business. (April 21, 2017 – Miami, FL) Miami-Dade experienced a healthy 2 percent job growth or 23,400 payroll jobs from March 2016 to March 2017 across industries with Education and Health Services (8,600) and Professional and Business Services (5,000) leading, according to state figures released Friday. “We’re seeing consistent yearly job increases across industry sectors which is the priority of One Community One Goal, an initiative of the Miami-Dade Beacon Council to diversify the local economy and bring higher paying jobs,” said Jaap Donath, Ph.D., Senior Vice President, Research & Strategic Planning for the Miami-Dade Beacon Council. 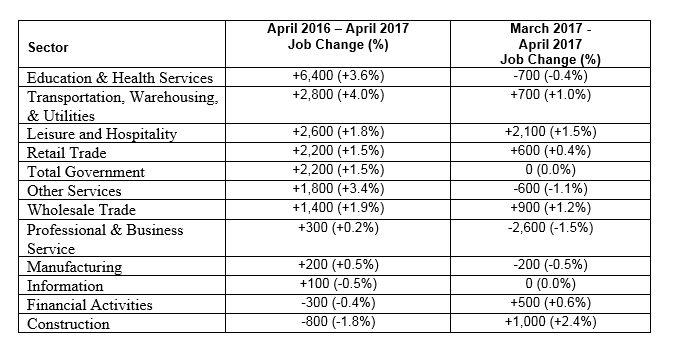 Miami-Dade County created 23,400 new nonagricultural payroll jobs (not seasonally adjusted), from March 2016 to March 2017 which was a 2.0 percent increase. Miami-Dade County continues to show year over year gains. Improvements in the non-farm payroll jobs can be found in a variety of sectors. 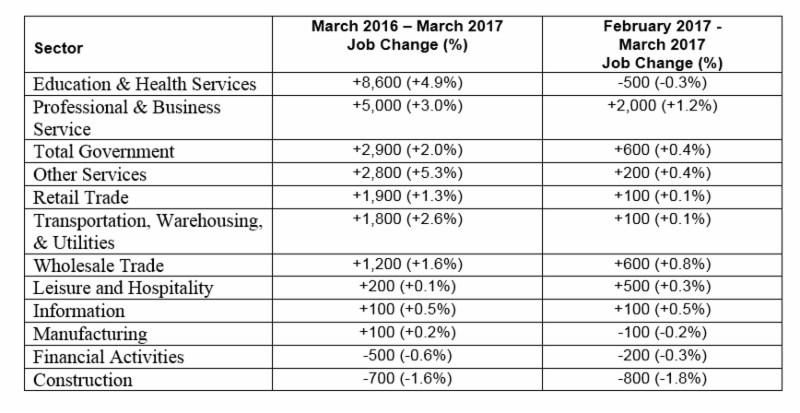 Between February 2017 and March 2017, Miami-Dade County increased nonagricultural payroll jobs by 2,600 or 0.2 percentage point. The not seasonally adjusted unemployment rate for Miami- Dade County was 5.3 in March 2017, which was a 0.2 percentage point increase from February 2017 at 5.1 percent, and 0.2 percentage point decrease from March 2016 at 5.5 percent. In March 2017, the seasonally adjusted unemployment rate for Miami-Dade County (taking seasonal fluctuations in the labor force into consideration) was 5.3 percent, which was an 0.1 percentage point lower than March 2016. Miami-Dade County had the highest annual job growth in education and health services (8,100 jobs) compared to other metro areas in Florida from January 2016 to January 2017, according to statistics released March 10. 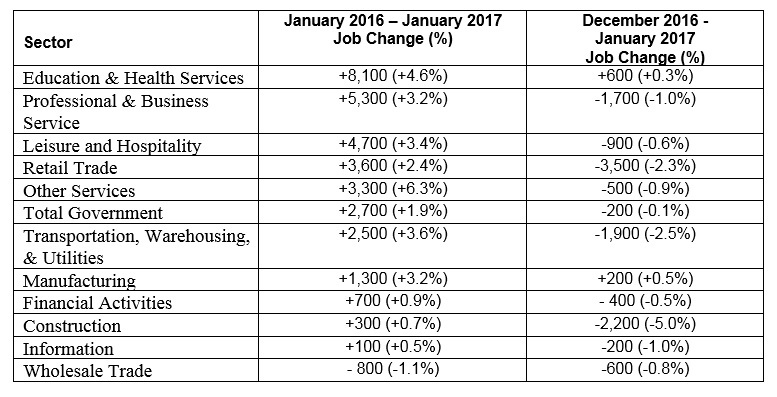 Miami-Dade County created 31,800 new nonagricultural payroll jobs (not seasonally adjusted), from January 2016 to January 2017 which was a 2.8 percent increase. Miami-Dade County continues to show year over year gains. Improvements in the non-farm payroll jobs can be found in a variety of sectors. Between December 2016 and January 2017, Miami-Dade County decreased nonagricultural payroll jobs by 11,300 or 1.0 percentage point. The not seasonally adjusted unemployment rate for Miami- Dade County was 5.1 in January 2017, which was a 0.2 percentage point decrease from January 2016 at 5.3 percent, and 0.3 percentage point decrease from December 2016 at 5.4 percent. In January 2017, the seasonally adjusted unemployment rate for Miami-Dade County (taking seasonal fluctuations in the labor force into consideration) was 5.5 percent, which is the same as December 2016. (Miami, FL – March 7, 2017) – It’s a night to honor the growth of commerce and the entrepreneurial spirit of Miami-Dade County. The 2017 Key Ceremony is the event of the year that recognizes new or expanding companies assisted by the Miami-Dade Beacon Council. This year, The Miami-Dade Beacon Council will honor 43 companies in our community on March 8 at the Hotel Intercontinental. The event presented by TD Bank includes an exhibit of the businesses during the Greenspoon Company Showcase. The companies, representing a variety of target industries including aviation, technology, trade & logistics, entertainment, manufacturing and healthcare and illustrate Miami-Dade’s diverse base of industries and its strength as a global business hub. The companies will be honored with a Key to the County by Miami-Dade County Mayor Carlos A. Gimenez, County Commissioners, City Officials and other dignitaries also slated to participate. “TD Bank is proud once again to be the Presenting Sponsor of the Miami-Dade Beacon Council Key Ceremony. At TD we believe in strongly supporting the organizations and events that bring awareness to the needs of our local economy and bolster job growth. The Key Ceremony is an impactful way to formally welcome companies that are new to Miami Dade County and recognize those who have recently expanded here.” said Pablo Pino, TD Bank Market President for Commercial – South Florida. Showcase/Reception begins at 6 p.m. Program – 7 to 8 p.m.
Almod’s Diamonds Limited – manufacturing company that sells branded and generic diamonds and diamond jewelry located in Doral. Alpha Trade – imports products used in construction and represents companies exporting their products to U.S. markets located in Doral. Break the Cup – packages, roasts and trades coffee located in Miami Lakes. Thank you to our event sponsors: TD Bank, Greenspoon Marder, 2020 Ponce, Becker & Poliakoff, BDO, CITIGROUP Center, Colonnade Plaza, Dosal Tobacco Corporation, EWM Realty International, FIU Business, InterContinental Miami, Miami Cancer Institute at Baptist Health South Florida, Ocean Bank, and Roar Media. Thank you to our sustaining investors: Miami Herald, American Airlines and MBF Healthcare Partners. //beaconcouncil.wpengine.com/wp-content/uploads/2017/06/BeaconCouncil_WebLogoCOLOR_340x156.png 0 0 wpengine //beaconcouncil.wpengine.com/wp-content/uploads/2017/06/BeaconCouncil_WebLogoCOLOR_340x156.png wpengine2017-03-15 19:14:342018-01-16 19:18:12The Miami-Dade Beacon Council "Unlocks New Worlds of Business Opportunity"
Miami is winning the brain gain race. A recent study supported by the Knight Foundation listed Miami as one of the top areas in the nation attracting young professionals. Miami’s share of educated millennials increased by almost 25 percent in the last 10 years, including a jump of 118 percent living near downtown. Why does it matter and what has changed to induce young, college-educated talent to stay in or move to our great city? The skills that businesses seek range from highly educated MDs, PhDs, engineers, software developers, etc. to highly skilled trades’ people including nurses, technicians, plumbers and electricians. So how has South Florida remedied its previous brain drain condition? First, we are growing more of our own talent. Under the leadership of Superintendent Alberto Carvalho, the Miami-Dade County Public Schools placed among the highest achieving school districts nationally in reading and math. Our graduation rate has improved dramatically and students have greater options to pursue career-focused curriculum at one of the many magnet schools and charter academies. Through the One Community One Goal initiative, academic and business leaders are working together, in an unprecedented fashion, to identify skills for today and tomorrow’s jobs, and close the skills gap. The Academic Leaders Council, led by FIU President Mark Rosenberg, includes the superintendent and the presidents of our local colleges and universities. Miami has also become a thriving college town with more than 380,000 students living and learning in our community. In today’s increasingly mobile world, we can’t forget that young people look for quality of place as much as they look for the right job to fit their career goals. The experience students have living here while in school is critical to helping them decide to make Miami their permanent home. As a relative newcomer to Miami, I can tell you that our community has much to offer young professionals whether they are starting a family or enjoying the single life. Miami is rich with authentic neighborhoods, ethnic cultures and an evolving music and arts scene. We have a wide range of sports, recreational and cultural activities, plus unique culinary venues and communities to cater to all tastes. We have lifestyle choices to match a person’s interests throughout their life stages. ▪ Second, Miami has evolved as a global business destination. The dearth of Fortune 500 corporations to train and entice young professionals has been overcome by an increasingly entrepreneurial ecosystem that is highly desirable to today’s millennial. According to the Kauffman Foundation, the Kansas City-based think tank that focuses on start-ups and entrepreneurs, Miami is ranked second nationally in entrepreneurship, beating out perennial favorites such as Boston and Silicon Valley. Our entrepreneurial infrastructure continues to mature thanks to groups like Endeavor Miami, Launch Code, eMerge Americas and the Idea Center which provide mentoring, funding and networking for young businesses. Miami may have won a battle in attracting young talent; now we have to win the war. We must support them so they stay in our community. We need their ideas, energy and ingenuity to continue to position Miami as a true global city, competing with Hong Kong, Singapore and Sao Paulo. The Beacon Council launched the New Leaders Taskforce with that in mind. In June the task force presented its second annual “Why Miami” panel discussion, where 200-plus young professionals shared their thoughts about how to meet the needs of the new generation. Their ideas included: fewer cars and more transit, quality public education, policies to embrace innovation, green spaces, access to recreation, the arts, and a diverse, open community. So while there is still work to be done attracting and retaining young talent of all types and ethnicities, we believe a young generation with a global mindset will be increasingly drawn here and choose to make Miami home and we will all be the better for it. LARRY K. WILLIAMS IS THE PRESIDENT & CEO OF MIAMI DADE’S BEACON COUNCIL. Miami-Dade County must keep diversifying its economy in order to protect against another recession, local community leaders said at an annual Beacon Council meeting on Wednesday. The Beacon Council, Miami-Dade’s economic development agency, announced plans to launch an online career portal for job-seekers and employers in seven key industries at the heart of its One Community One Goal initiative, which was launched in 2012 to create local jobs with good salaries. The target industries include aviation; banking and finance; creative design; information technology; hospitality and tourism; life sciences and healthcare; and trade and logistics. Those fields are important because they offer plenty of so-called “middle-skill” jobs that pay a living wage, according to a report presented by JPMorgan Chase. Middle-skill jobs require additional training beyond high school but do not require a bachelor’s degree. About 22 percent of Miami’s 1.2 million jobs are middle-skill roles that pay a median hourly wage of nearly $25, JPMorgan found based on data from 2014. The region’s median wage is $18.48 per hour, according to the study. Still, local employers are struggling to find workers for those positions because lower-income residents don’t have access to the training they need, said Chauncy Lennon, managing director of global philanthropy at the investment bank. The seven target fields are expected to create about 9,540 middle-skill job openings per year through 2019. To connect would-be workers with such jobs, the bank recommended that the Beacon Council and its community partners invest in training for low-skilled youth and adults interested in the two fastest growing fields — trade and information technology— and advertise about the availability of positions. Larry Williams, president and CEO of the Beacon Council, a public-private partnership funded partly with tax dollars, said the JPMorgan report would guide the council’s planning on job creation in the future. This year’s co-chairs for One Community One Goal are Matt Haggman, Miami program director for the Knight Foundation, and Nelson Lazo, CEO of Doctors Hospital Baptist Health South Florida. About 500 people who attended the event, held at Jungle Island, also learned about progress in the initiative’s various goals, including a paid internship program for local students announced in April. The Talent Development Network so far has 45 postings from Baptist Health South Florida, American Airlines and Miami-Dade County, said Steven Rojas Tallon, program lead for the network. The network plans to create about 200 paid internships in the next 20 months, he said. Alexander Iglesias, a rising junior at Florida International University, started an internship with Baptist through the network earlier this month. “It’s a great opportunity to get real-world work experience,” Iglesias said. FIU president Mark Rosenberg urged business leaders in the audience to register for the network. “It is a shared responsibility for us to generate the talent for this community but we cannot do it without you,” Rosenberg said. Progress on other initiatives has been slower. An incubator for talented local fashion designers was formulated three years ago and officially launched last year at the downtown Macy’s store but still needs about $150,000 in funding. It is looking to local companies for help and has secured space at the Macy’s stores that will open at the new Miami Worldcenter mall in the fall of 2017. New programs include a similar incubator for trade and logistics and an urban initiatives committee that will help grow businesses in lower-income areas. “We’re really going to be looking at how we grow the innovation system, the entrepreneurs, so we can grow that next generation of ingenuity here in Miami-Dade,” Williams said.